We live in a world of seeds. From our morning toast to the cotton in our clothes, they are quite literally the stuff and staff of life: supporting diets, economies, and civilizations around the globe. Just as the search for nutmeg and pepper drove the Age of Discovery, coffee beans fueled the Enlightenment and cottonseed sparked the Industrial Revolution. Seeds are fundamental objects of beauty, evolutionary wonders, and simple fascinations. 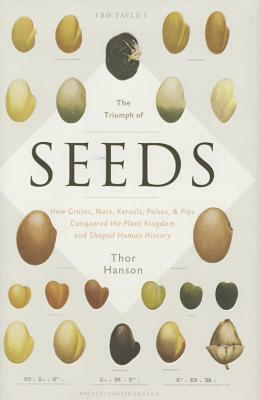 Yet, despite their importance, seeds are often seen as commonplace, their extraordinary natural and human histories overlooked. Thanks to this stunning new book, they can be overlooked no more. This is a book of knowledge, adventure, and wonder, spun by an award-winning writer with both the charm of a fireside story-teller and the hard-won expertise of a field biologist. A fascinating scientific adventure, it is essential reading for anyone who loves to see a plant grow. Thor Hanson is a conservation biologist, Guggenheim Fellow, Switzer Environmental Fellow, and winner of the John Burrough Medal for excellence in nature writing and natural history. The author of Feathers and The Impenetrable Forest, Hanson lives with his wife and son on an island in Washington State. will engender thoughtful consideration of our joint future."